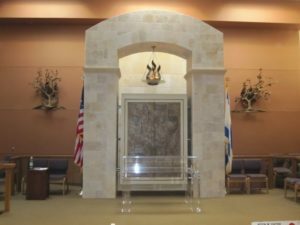 What is Unique about the New Jersey Synagogue, Temple Rodeph Torah? All temples are not the same. Every temple has a different “spirit,” different policies and practices, different members and different staff. As a potential new member, you are probably asking, Is Temple Rodeph Torah right for me? What makes TRT different from other New Jersey synagogues? This page provides some thoughts to help you identify how well TRT aligns with your goals for temple membership. TRT is a Reform congregation, with a traditional approach to prayer. Some people assume that a Reform temple has only non-traditional services, primarily in English, but that’s not us. Our services are about 50/50 Hebrew and English, and typically last about 75 minutes (Friday night) or 90 minutes (for Saturday morning services with a Bar or Bat Mitzvah). Our cantor usually sings a cappella (e.g. without an instrument), although we occasionally bring in a keyboard player and some services utilize our own, 4-person klezmer band. Since September 2011, we host Rock Shabbat services one Friday night each month. We also hold informal Saturday morning Minyan services, separate from the larger Bar/Bat Mitzah service, and Minyan attendees usually dress casually. These Saturday morning Minyan services include prayer and Torah study, and typically last about 1 hour. Many congregants wear a kippah during services, and some wear a tallit. In keeping with the ideals of Reform Judaism, these are personal choices that we respect. At TRT, we believe that the individual should understand the rules and traditions of Jewish life, and decide for themselves what actions are appropriate. We encourage our members to continue learning, and we provide a safe environment to “try on” new observances, to see what feels comfortable. For example, some of our members keep kosher, and all food served at the temple is kosher-style. Children in religious school have a service attendance requirement for each year. Although these requirements are reasonably small (e.g. 5 services per year), the requirements are strictly enforced, because we believe that children should experience Jewish prayer and Jewish community so they can feel comfortable in any temple, anywhere in the world. Lifelong education is a central part of life at Temple Rodeph Torah. Our Adult Education courses are well attended (about 70 students per year study with the rabbi) with meetings every two weeks for 90 minutes. In recent years, we have studied Jewish ethics, women’s roles in Judaism, the history of Jews in the US and Jewish mysticism. The topics vary year to year, and this year’s class is THE MISHNA: A RADICAL BOOK FOR TROUBLED TIMES? TRT is committed to the highest standards in our religious school as children approach their Bar/Bat Mitzvah, and throughout the educational lifetime. We are enormously proud of our school and how well educated our children are. We developed a thorough, engaging and creative program which meets once to twice per week. Students in kindergarten through 4th grade attend once per week, and 5th through 7th graders are offered an enriched curriculum during a second day, two hour offering. Our Jewish High School program for 8th-12th graders, is extremely popular, with most of our students voluntarily continuing their education throughout high school. Our goal is clear: to educate our children for a lifelong commitment to Judaism and to help them become active members of the Jewish community. To this end, our school focuses on many items besides preparing children for their Bar/Bat Mitzvah. From exploring their ancestry and connecting with their parents and grandparents, to wrestling with the Torah with Rabbi Weber, our students see Judaism as an essential part of their lives. TRT members have a wonderfully strong social action inclination. Our Social Action committee is one of the most active groups in the temple, organizing charitable activities and reaching out to our community in several ways. We are also home for the nationally-recognized community support group, TRTCares. TRTCares was formed a few years ago during the worst of the recent economic crisis, and consists of members and non-members providing free professional services (legal, job-seeking, financial, mental health, etc.) for our community. Our community activism has resulted in significant press coverage, including articles in the NY Times, USA Today and Newsweek, and TV coverage on ABC News. We’ve been honored by Monmouth County Freeholders and the Religious Action Center for Reform Judaism in Washington DC. TRT is completely egalitarian – there are no roles restricted to men or women. We also welcome inter-faith couples, and non-Jewish spouses are invited to participate in all Temple activities. We firmly believe that Judaism is made stronger when we reach out to everyone who wants to come in, and we hope that everyone who walks through our doors feels respected and appreciated. Learn more about how to select a temple using our infographic or by downloading our free eBook. Many members of TRT socialize together, including our monthly bowling league and other temple-sponsored events. Last year we sponsored a great comedy night and a casino night, and we have plans to repeat them both in the coming year. Many members find that their fellow congregants become close friends outside of temple activities. TRT is run primarily by volunteers. We have a small staff, and volunteers handle large portions of the temple administration. All our members are expected to volunteer to some degree, including required ushering assignments for one or two services a year. TRT members are truly a warm and friendly bunch. Of course, just about every temple advertises their warm and welcoming congregation. But we really believe that we are unique, and we hope you will take the time to judge for yourself. Please come to a service, or sit down and talk with our rabbi, cantor or educator. Whatever brings you in our doors, we will welcome you!